The NuSTAR space telescope was launched in 2012 and is specialized in observing the sky detecting in particular high-energy X-rays. It was used to observe the region known as Sagittarius A* or Sgr A* at the center of the Milky Way, where there’s a supermassive black hole. It was found that the interesting area is more extensive than thought and includes an area with a diameter of about 40 years light across where the X-ray emissions are higher than expected. Kerstin Perez of Columbia University in New York, lead author of the article, explained that thanks to NuSTAR it was possible to observe a completely new component of the center of our galaxy. That area is full of low energy X-ray sources but their output is very weak when it’s examined using NuSTAR so the new signal stands out. According to one theory, the zombie stars may be pulsars. These are neutron stars that remain after a supernova. Pulsars spin wildly with intense radiation emissions. 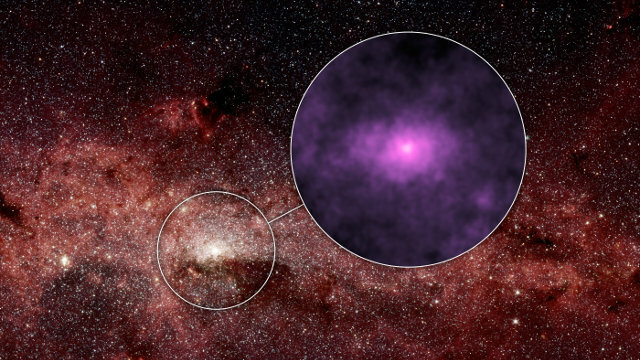 It’s possible that NuSTAR has discovered a population of unknown pulsars in the center of the Milky Way. According to another theory, the X-rays may be emitted by white dwarfs. They are what remains after the death of stars that are not very massive, such as the sun. Their density is greater than the period of their normal life so they have a strong gravitational field and can emit high-energy X-rays. According to the third theory, there may be small holes blacks born after supernovae that have left stellar nuclei massive enough to collapse more than those that form pulsars. They could slowly feed off their companions and the matter falling towards them may emit high-energy X-rays because of their intense gravity. The last theory is the one that doesn’t involve the existence of stellar sources. The high energy X-rays could be originated by a sort of diffuse haze caused by cosmic rays. These charged particles originated from Sagittarius A* as the supermassive black hole captures nearby matter. Again, this matter could emit high energy X-rays due to the intense gravity. Observations of that area were already made with the Herschel space telescope but NuStar has very different characteristics. Kerstin Perez admitted that none of the theories explain definitively the source of X-rays. Chuck Hailey of Columbia University, co-author of the study, explained that this result reminds us that the center of the Milky Way is a bizarre place. Stellar objects exhibit strange behavior when they are crammed into small areas near the supermassive black hole. This is only the initial part of the research and other observations have already been planned by the team that is conducting it. Understanding the origin of the high energy X-ray emission discovered will help to better understand the mechanisms of evolution of galaxies.